A Bear, a Bee, and a Fox walk into a shopping cart. I went to Buy Buy Baby today to exchange a changing pad cover today (even exchange, bought by in-laws) and picked up some toys for Babystar. I read that infants like things that are black and white, and she seems to be looking at more than just me lately. Hope she likes them! 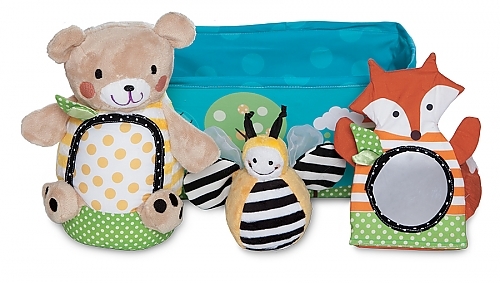 The black and white bee jingles, the fox has a cool mirrored belly, and the bear lights up and plays a tune when kicked. $14.99. Previous Can I See Your Papers? Next Shots, Shots, SHOTS, shot-shots!